There are currently no setups for Caterham 7 (rFactor2). Add a Setup. 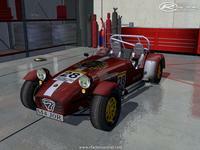 There are currently no car skins available for Caterham 7 (rFactor2). If you are a painter you can share skins for this mod via the Car Skins area. Visit the Spray Booth for painting tips & tricks. This version of the Caterham is dead. The download was stored on my Virgin Webspace, which doesn't exist anymore. This version was crap anyway. MikeeCZ took over a long time ago and has released his version....somewhere? Check out the rfactor2 forums, as I have no idea where to get it. The circuit is 10, I love it. But it has a problem of virtual holes in circuit zones and cars seem to fall. Please fix it , the circuit is excelent. Any chance the links to the downloads could be sorted as both appear to be broken? It is still being worked on and not forgotten...all I can say for now. @Major_Parts Was wondering if there are any updates regarding the new version you mentioned? ie. Current build status, Modder etc. Would dearly love to get my mitts on the beta/demo you spoke of. Thanks. The car is currently being remodeled. I don't know if the modeller is going to see it through to have all the upgrades that rf1 had, but the default car looks 1000 times better! Still planning to update this? Or port to Assetto Corsa...? How does this one compare to Rfactor1 equivalent? Worth buying rf2 just for this? The rf1 version is more complete with several classes and loads of upgrades. This rf2 version has only the Classic for now with limited upgrades. The driver is animated, albeit in a quick, temporary state. The models are being done from scratch now though and are very impressive. A new driver is currently being optimized and animated and also windscreen wipers will be animated.